In the beginning He said it was good. When we are young, like the earth was then, don’t we feel good? Mama hangs our colorful scribbles up proud on the fridge. We offer what’s in our hands and it is accepted with open arms. I don’t think that longing ever leaves—for our handiwork, our offerings, to be deemed “good”. I remember it well, in 8th grade English class, when I forgot to include a topic sentence in my essay. The teacher gave me a D because I hadn’t produced what was required. Her feedback felt like “Not Good” was stamped across my forehead, in scribbly red letters. Not only that, but she recommended that I take English 101 instead of Composition 1 in 9th grade. This lover of words was devastated. I used that “not good” as motivation to prove her wrong. I got 100% in English 1 and went on to become an English minor in college. Last year I decided to start writing like never before and began my first book. As my heart poured out the words I wondered if others would think it was good enough. This yearning for validation lingers long and strong. It can drive us crazy or drive us to Easter and all that it stands for. And, if we choose the latter, we remember when Jesus stamped “good enough” with His red blood on that cross. He offered up Himself with open arms as His hands were pierced on behalf of our sin, because of our “not good”. He lived sinless, died for our sins, and rose again in victory. 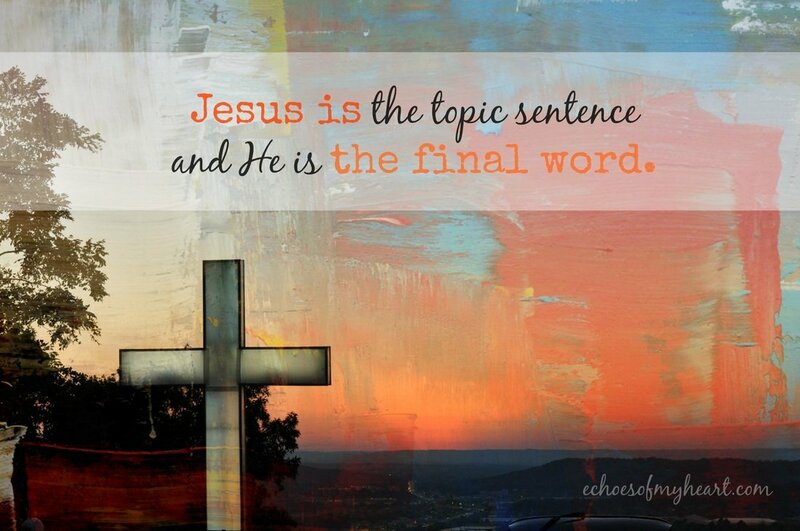 He is the topic sentence and He is the final word. As we let Jesus write His salvation into our story we can rest in the fact that He is indeed enough. Our striving ceases as we rest in His Sufficiency. As we accept His handiwork, His masterpiece, we are restored through His resurrection…and that is “Very Good”. How does Christ’s resurrection give you tangible hope in your trials? P.S. I’m linking up with The High Calling and also Kate Motaung for Five Minute Friday. Come write your heart out as we explore Jesus’ Resurrection and the Good that is found in Him alone. I am so glad that you proved the teacher wrong as you have a wonderful gift for writing! I love how you tied His creation together with childhood and that longing we have to feel good enough. That is so true! I wish you a blessed Easter. Thank you Carrie. :) Happy Easter to you too! I love that “Jesus is the topic sentence” line. That’s exactly it–good call! I hope I never write “Not Good” on a poor student’s paper :(. That’s horrible. I try to focus on “What changes do you think would make your paper stronger” :). Katie, so much of this resonates with me, too. 🙂 I love the thought of being driven to Easter and the “good enough.” So thankful He is the final word, too! I really enjoyed the play on words here for FMF. Beautifully crafted words of hope. Have a blessed Easter, friend! Hi there Katie! This is a beautiful post, and I certainly want to let Jesus write salvation into my story. God’s grace on your book. I can’t believe that English teacher! But then again, it’s easy to judge. Makes me wonder how often I communicate an unspoken “not good” message to my kids or to others??? Lord, let us be pass on positive messages! Katie, I love that are beginners were very similar. That made me smile too! We are indeed good enough and God showed us by sending his son to die on the cross for us. He has been leading me this year on a discovery of Grace, though my oneword365 is “Joy”. So thankful to have found you along the way!